One of the new items this year is also the LokPilot Fx V4.0. 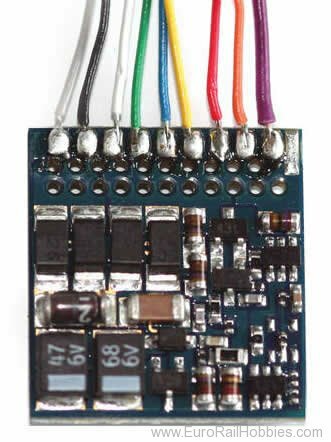 This small but nice function decoder has no motor output and is perfectly made for control cars or functional models. As it speaks DCC with RailCom® as well as Motorola® and Selectrix® it can be operated with all common digital command stations. Its flexible function key allocation and the various light effects are typical ESU V4 decoder features. The LokPilot V4.0 is available in two interface versions: the “classic” 8-pin NEM 652 wire harness version as well as a 21MTC interface version. The LokPilot Fx V4.0 is multi-protocol decoder meaning it speaks all common data formats such as DCC, Motorola® and Selectix®. In DCC mode 14-128 speed steps are possible, as well as 2- and 4-digit addresses. You can activate up to 28 functions. Thanks to RailComPlus®, the decoders will be automatically recognised by a suitable command station (e.g. ECoS). It is able to control all DCC programming modes und thus can be driven and programmed by all DCC-compatible digital command stations. CV values can be read out on the main track with corresponding command stations, thanks to RailCom®. There are indexed CVs for command stations which are only able to program CVs from 1-255 (e.g. ROCO® Multimaus). Motorola® users benefit from up to 28 speed steps with 255 addresses. Three further Motorola® addresses allow the activation of 16 functions. The installed programming mode makes re-programming with the venerable Control Unit® 6021 also possible. The LokPilot Fx V4.0 decoder auto-detects the known Märklin® braking sectors as well as the ZIMO® HLU braking commands or the Lenz® ABC system. Braking with DCC brake generators or with DC (“Brake on DC”) is supported. Furthermore you will be able to stop your train by using the Selectrix® braking diode. Although this decoder has no motor it is, however, important for the functional decoder as well as the car decoder that they recognise the entrance of a brake section. The LokPilot Fx 4.0 decoder can be used for both analogue DC or AC locomotives. The decoder automatically switches between the different operating modes “on-the-fly”. In most cases one does not have to adjust anything. The LokPilot Fx V4.0 can also be operated with a LokSound V4.0 and a LokPilot V4.0 decoder: Therefore it´s possible to e.g. install a LokSound V4.0 decoder into the loco of a trainset and equip the control car with a LokPilot Fx V4.0. Provided they have the same address, the decoders will act absolutely identical. The identical CV arrangement makes the synchronisation of both decoders easier. The LokPilot Fx V4.0 decoder has 6 function outputs. The wire harness version is usually amplified. For the 21MTC version you can select between an amplified or a logic level for AUX3 and AUX4. All important light functions are available. The brightness of each output can be adjusted separately.